By Shane McGlaun on 08/04/08 • Leave a comment! I grew up on Atari, moved on to Nintendo and then to PC gaming as the years went by. I am always looking for cool gaming gear that will make games more fun and enjoyable. Driving and racing games are one of my favorite genres and things like force feedback steering wheels make the games much more fun. I am still waiting for full-motion simulators to get affordable so I can add one to my collection of gaming gear. Gyroxus released what it calls a full-motion video game chair this spring. 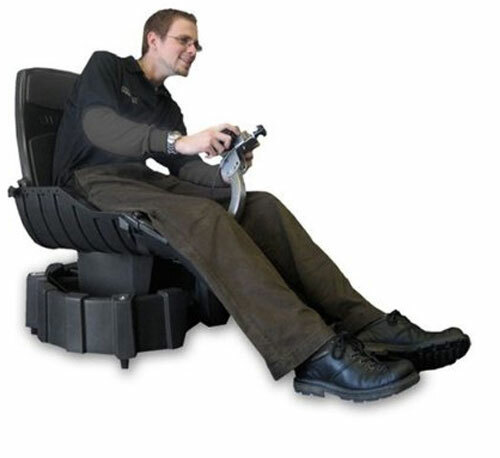 The chair sold for $489 when it was first launched — not too bad for a full-motion simulator. The Gyroxus price was cut significantly today making the chair now sell for $389. The chair is compatible with the PS3, PS2, Xbox, and Windows PCs. The chair has an adjustable back to accommodate users of different heights and a USB port on the chair so you can plug the controller and chair in with one cable. What I can’t figure out from the videos on the site or the description of the product is if the chair is motorized or simply leans based on how you move when in the chair. There is no mention of motors, drivers or of needing games with compatibility for the Gyroxus to function leading me to believe you simply lean in the chair. The price also makes me think the Gyroxus is gravity powered, all motorized full motion simulators I have seen run well into the thousands of dollars.